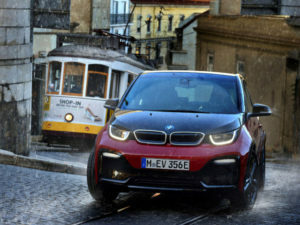 BMW is set to roll out the traction control system from the i3 electric car across all future BMW and MINI products as it shows how electric vehicle tech can be used to enhance internal combustion vehicles in the near future. The carmaker said that the technology – created to cope with the near instantaneous response from the electric drive of the BMW i3 – plays a crucial role in the driving performance of the i3 by bringing 50-times faster responses than conventional driving stability systems thanks to calculating the control process directly in the powertrain instead of in a remote unit requiring long signal paths. In particular, the technology improves traction and driving stability in adverse weather and road conditions when pulling away, in active Brake Energy Regeneration phases and when accelerating out of tight corners for the i3, which provides 199.1lb/ft (270Nm) torque and 182bhp from 0rpm. However, the company added that the same technology can also work equally well on cars with internal combustion engine and will be fitted in future BMW and MINI models with front-, rear- and all-wheel drive. The news marks an interesting shift in engineering with the company using learnings from electric propulsion to enhance internal combustion vehicles, rather than the other way around. “With their high levels of torque and instantaneous responses to every movement of the accelerator, electric motors already make significantly higher demands on driving stability systems than conventional power units,” said Peter Langen, head of chassis development at BMW.